Between Position 0 and Position 4 on the line, disjointed wings and fuselage segments from around the world merge into a glossy white wide-body ready for the paint hangar and some major airline’s corporate livery. Westenskow enumerates the segments while extemporizing an atlas of global outsourcing: “Forward portion’s from Spirit Aerosystems in Wichita. Vertical fin’s from Boeing fabrication division in Tacoma. 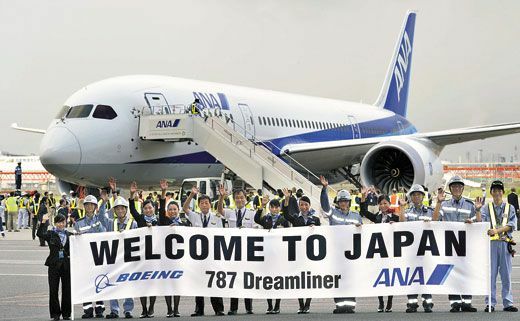 Tail cone’s from Japan, the horizontal stabilizer and fuselage segments are from Alenia in Italy.” The precision specs involved in 787 assembly impose upon Boeing’s worldwide partners a conformity undreamt of by the United Nations. 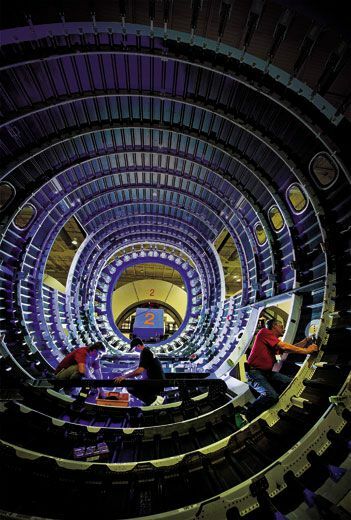 With a passing glance, it’s impossible to distinguish 787 composite components cured in an enormous autoclave in southern Italy from those produced in the American heartland or at a Japanese aerospace giant. Under the scrutiny of quality control engineers at Boeing, however, the contrasts have sometimes been stark. Alenia Aeronautica improperly torqued shims used to fill gaps in the airplane’s horizontal stabilizer. 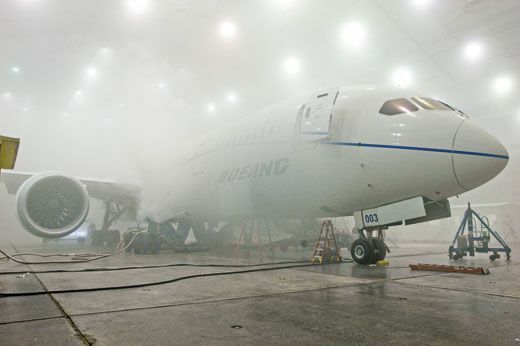 The errors threatened the component’s structural integrity, briefly halting 787 test flights in 2010. The year before, Boeing discovered that the skin of Alenia’s composite fuselage segments had wrinkles caused by internal stringers that were out-of-spec, necessitating patches to existing segments and design reworks for future production. While outside analysts report that Boeing is satisfied with Alenia’s improved performance over the past year, particularly the fuselage segments made in Grottaglie, the company maintains tentative plans to shift initial primary production of the stabilizer for the 787-9 variant back to Seattle. “Challenge” is one word for what confronted him. Overweight, over-budget, and overdue are others, with footnotes for striking unions, stressed-out customer airlines, and structural cracks. The 787 is in many ways a clean-slate departure from Boeing’s aluminum airliner fleet; its composite structure, intended to lower operating costs by reducing weight and therefore fuel usage, and features emphasizing passenger comfort, inherited from the Sonic Cruiser concept of the 1990s, had never before been built. The innovations turned the project into a saga of technical tribulation and continual organizational gut-checking. Now that the official EIS (entry into service) is history, expect some of that drama, and the thousands of aviation blog posts it spawned, to begin a slow fade. Though Fancher laughs when he remarks that most development projects in aviation “seem a lot easier after some time has passed,” he’s right. Few today remember the problems the now-sainted 747 faced: Engine faults necessitated grounding the first 20 production models for months, and recalling the airplane delivered to launch customer Pan Am. At the assembly line’s present rate, 3.5 Dreamliners roll out each month. By contrast, in the same time span, Boeing produces 1.5 747s. 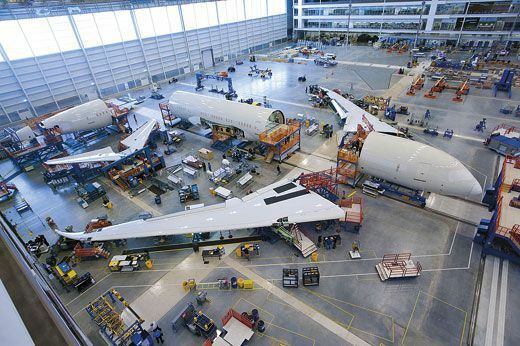 By the end of next year, with additional production boosts, the planned addition of a “surge line” in Everett and production from Boeing’s Charleston, South Carolina assembly facility, every month 10 back-ordered Dreamliners will wing into the waiting arms of an airline. Only the 737 is produced in larger volume (currently 35 rollouts monthly). At Position 0, newly arrived composite components pause for 24 hours so their temperatures will stabilize. Tolerances for assembly are so tight that even minute variations—slight contraction caused by exposure to cold on the flight from a manufacturing center to here—can affect the process. At Position 1, the big pieces come together, Westenskow says: “All five at once: two wings and three fuselage segments.” The FBJ (Final Body Join) tool, a multi-tentacle jig, cradles the constituents and uses indoor GPS and laser measurement devices to mate them with automated accuracy. Position 2 finishes the electrical connections among the segments and installs the floors. Position 3 fits the interiors. Position 4 tests all functions. The strikingly svelte 787 wing, displayed overhead in the jig that mates it to the fuselage, looks like a gallery exhibit. Westenskow points, tracing the aesthetically pleasing curve. Produced by Mitsubishi Heavy Industries in Japan, its carbon-fiber–aluminum hybrid structure is as mean as it is lean. Exactly how thin the wing is, Boeing won’t say. But Everett workers chosen to squeeze up into it must pass a physical qualifications test “which includes a very small hole,” Westenskow says. With line speed-ups looming, the wing join process is the key to making delivery commitments. If things slow down here, everything else stops. It has happened before. Unlike aluminum airplanes with substantial spars spanning the connection between wing and fuselage, or wing join, the Dreamliner’s mostly composite wings bolt directly to the fuselage in a complex connection called the “side-of-body join.” Two years ago, stress tests revealed cracks in the center wing box (where each wing joins the airplane’s body inside the fuselage), bringing the vast project to a standstill for months. A time-consuming redesign to the fittings that support the connection at stringer (stiffening rods on each wing’s upper skin) attachment points was proved through exhaustive testing. Westenskow calls the team now implementing the modification at Position 1 “the best mechanics in the program.” That would be Erwin Arlantico and crew. They bear the sobering responsibility of attaching 787 wings.